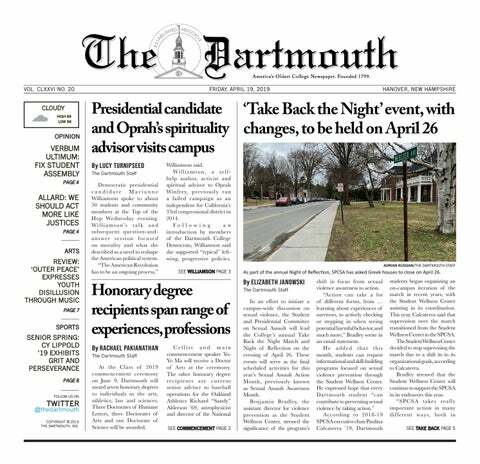 Beginning in the spring, Debora Hyemin Han ’20 and Aidan Sheinberg ’20 will serve as The Dartmouth’s new editor-in-chief and publisher, respectively. Two-time Paralympic alpine skier Staci Mannella ’18, who is accustomed to overcoming challenges stemming from disability, has recently been a driving force behind Dartmouth’s policies toward students with disabilities. These days, we do a lot of documenting without a lot of remembering. The Campus Climate and Culture Initiative, or C3I, will take effect immediately, with mandatory Title IX training for faculty and staff beginning this week along with plans to present a unified policy on sexual misconduct to the faculty by the end of the term, according to provost Joseph Helble. The initiative, which was announced by College President Phil Hanlon through an email on Jan.